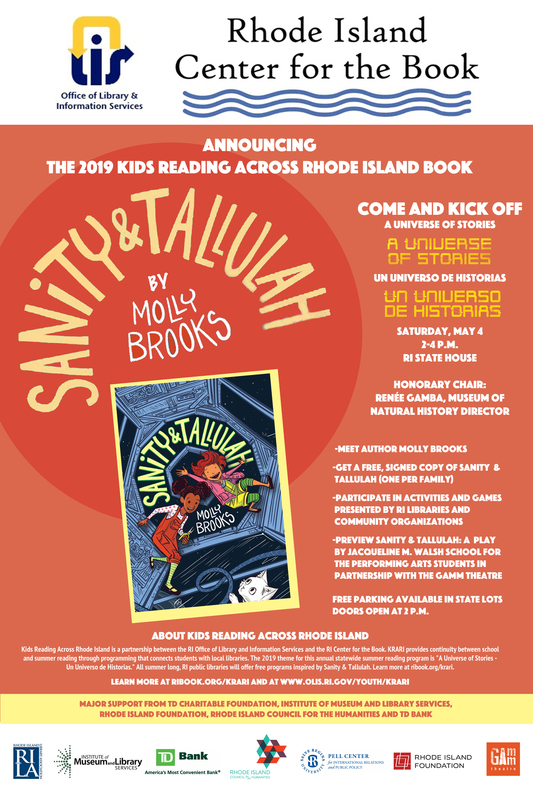 Meet Molly Brooks, author of Sanity & Tallulah. Each family will receive a free copy of Sanity & Tallulahthat they can have signed by the author. Enjoy activities with RI public libraries and organizations, music, art and more! Download the poster. Since 2009 The Center has partnered with the Rhode Island Office of Library and Information Services for a summer reading program focusing on children in grades 3-6. KRARI seeks to instill a lifelong love of reading while preventing summer learning loss. KRARI kicks off at the magnificent Rhode Island State House, hosting hundreds of young readers and their families, who receive the selected book at no cost and meet the author. For many of the students, it is their first encounter with a live author which makes a lasting impact. The program then launches into book groups, crafts, theater and visual arts events throughout the summer to stimulate young readers.